E.S.B.V. 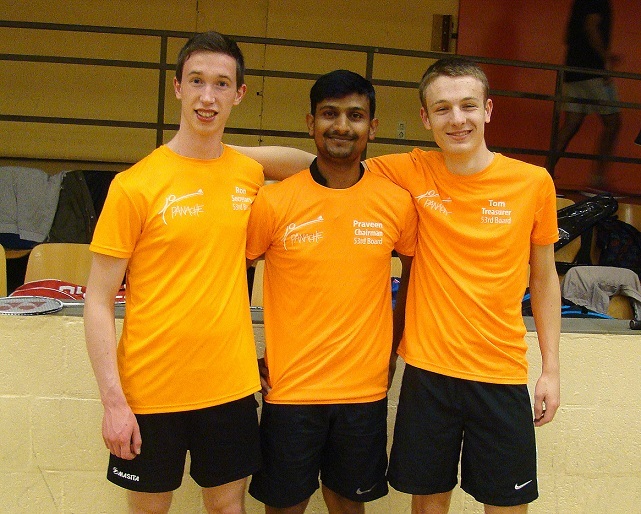 Panache – Page 2 – Welcome to the Eindhoven Student Badminton Association "Panache"
The 53rd Board is happy to announce that we have a new trainer! Our new trainer, Eli Mambwe, is a formal Olympic candidate, formal player in Top class competitions in Germany and the Netherlands and nowadays a renowned trainer. The first trainings last Monday already set a good note. We hope that everyone likes it as much as we do! !! From now on we’ll have trainings again for all members of Panache 😀 !! For more information check the page “Training”. CHAMPIONS! 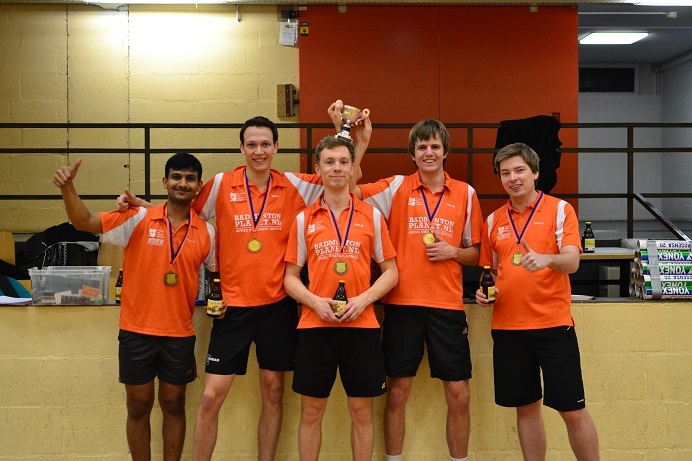 ESBV Panache H1 have won the Eerste Klasse afd. 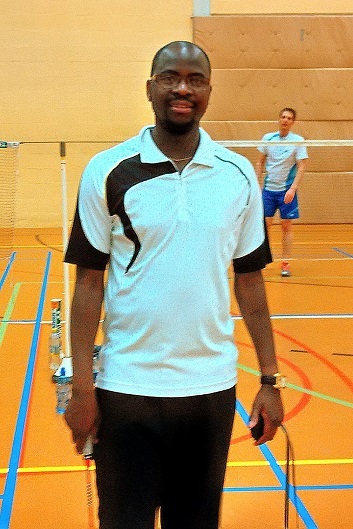 1, Regio Noord-Brabant (Badminton). By winning their league, they qualified for the Regional tournament Eerste Klasse, Regio Noord-Brabant….which they also won! They will now respresent the Province of Noord-Brabant at the National Tournament Eerste Klasse. Congrats guys and good luck at national level! Two weeks ago we informed our members about this unique PAktivity. 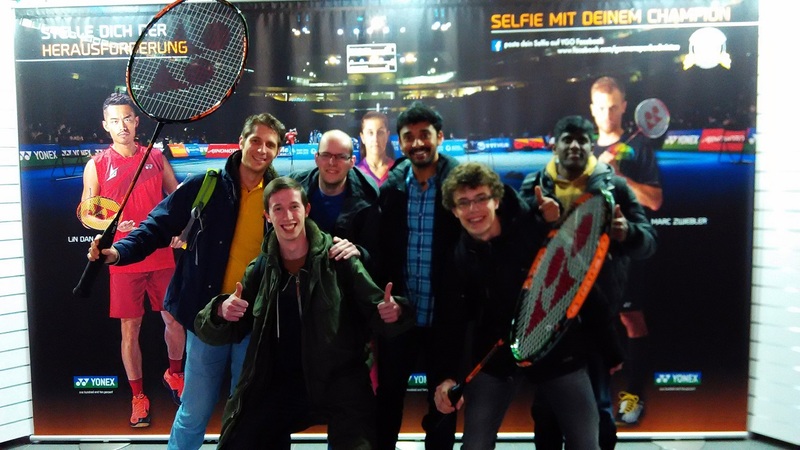 Last Saturday we travelled with a group of nine enthusiastic Panache members towards the Yonex German Open. This is a international Badminton tournament, that recently upgraded its status to a Grand Prix Gold tournament. Thanks to its upgraded status, the German Open can now atract world-class players even better. This year the absolute star player was Lin Dan! But also in the women’s single and in the doubles there were enough players from the top ten of the BWF World Ranking. Enough reasons to organise a trip to Mulheim an der Rühr, that’s even less than one and a half hour driving from Eindhoven. Saturday was the semifinals day and that was made clear to us! We have seen a lot of exciting matches and almost all of them were three-setters. Resulting in much and long entertainement and enshured us a great day! Officially we were with nine, but three of our group already walked to the car at the time this picture was taken. At least I want to thank everybody that participated on this trip for the nice day we had! Next year we’ll do it again! The second PAKtivity of the new season is coming! This time we would like to go ice skating with the whole group at the IJssportcentrum in Eindhoven, Antoon Coolenlaan 3, on Tuesday the 2nd of December. We will gather in front of the center entrance at 19:45 so we can start when it opens; this way we can skate for two hours. 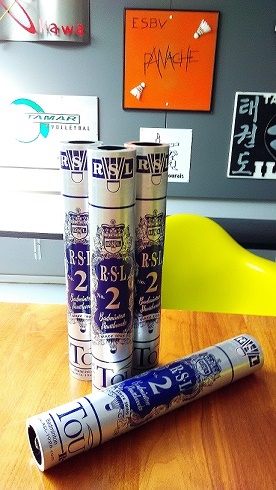 You can get a discount with your studentsportscard on the entrance fee of the IJssportcenter. To get this discount you will need to state your intention for ice skating to the front desk of the student sport center. They will give you a sticker and the entrance fee will only be €2,50 which will be paid by Panache. If you do not have this sticker, the fee might be higher. Panache will still pay €2,50 the rest is up to you. If you do not have ice skates, it is possible to rent them for only €4,00 at the IJssportcenter. During the general member meeting on 13th November, the 51st board (Matt, Stefen and Sara) has been discharged and the 52nd board board has been officially installed! The new board consists of: Remco Aarts (chairman), Rik Sweep (treasurer) and Cong Yu (secretary). As new board member we would like to thank the old board for their excellent work in the past year and at the same time we are ready to commit ourselves for a healthy growing Panache. More importantly, we are ready to help! Thus for anything Panache related, do not hesitate to contact us. At least one of us will be presented at every play evening. To know us a bit better, Please check out the newest issue of minipette during the play evening! There you can read about the self-introduction of the new board (in English) and the summary of the board year 2013-2014 from Matt (in Dutch). Alternatively, you can check out our website www.esbvpanache.nl. A short announcement: due to too small amount of players present at the test playing time slot (Tuesday 17.00-18.30) in October, this playing time slot no long exists. Thus our playing time goes back to Monday and Thursday 20.00-23.00, Hal 1. This year the Panache Activity Committee started with a fresh new group of enthusiastic people who already had so many good ideas for the coming year. 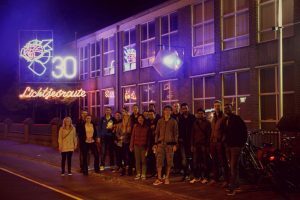 To keep the first activity easy accessible for our newest members (and older ones) we ‘organized’ the traditional Lichtjesroute bicycle tour. Starting from the 18 Septemberplein a group of 20+ Panachers followed the lights on a tour through Eindhoven. Along the way we encountered all kind of shapes like birds, pirates, giraffes, fish and few unique ones like the Evoluon or a huge whale. The main attraction was the Smurfs on a boat or carousel peacefully reflected by the surrounding pond. After a short pit-stop at a certain fast-food chain we continued our path south to complete the 22km tour. To finish the evening we gathered somewhere on Stratumseind for a drink and gezelligheid. 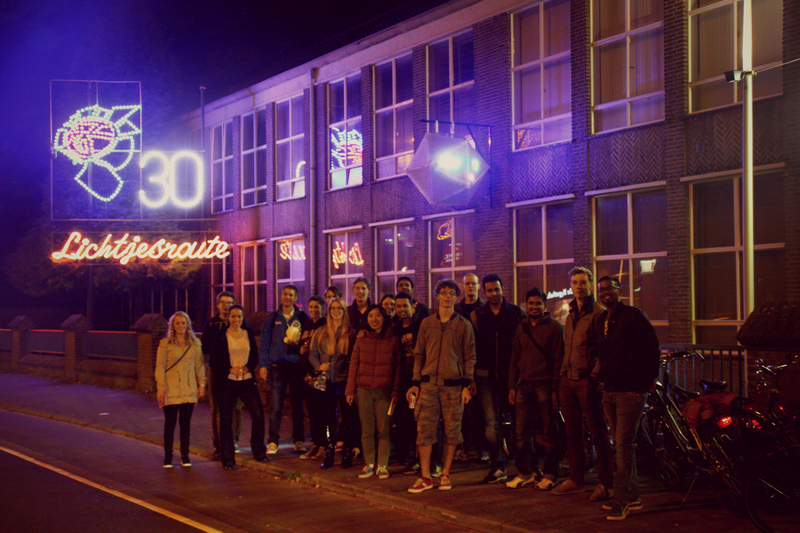 It was a successful activity to get to see Eindhoven and enjoy each other’s company. 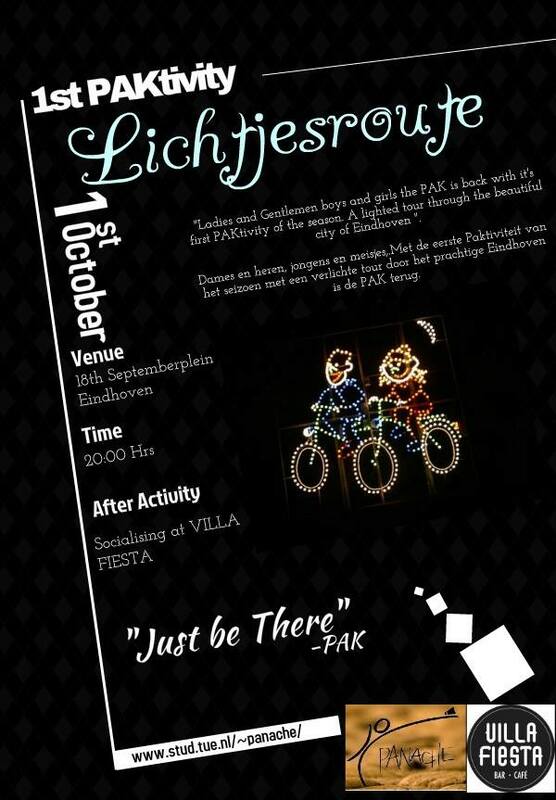 The first Paktivity of the year is a fact! We will go by bike through whole Eindhoven and follow the light route. Signing up is possible at the playing evenings (today and monday) or by email: pak@esbvpanache.nl.